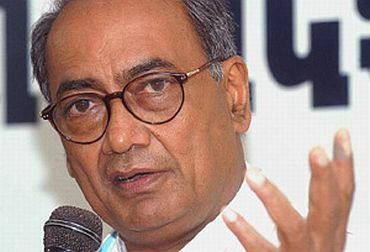 Senior Congress leader Digvijay Singh on Friday said people close to social activist Anna Hazare were "somehow close" to Bharatiya Janata Party and questioned the inclusion of father-son lawyer duo of Shanti and Prashant Bhushan in the ten-member joint drafting committee on Lokpal Bill. He also cautioned "simple and naive" Hazare about people close to him, saying they have "their own cause" to push and asked why he did not choose Aruna Roy or Harsh Mander to be on the joint drafting committee for Lokpal Bill. 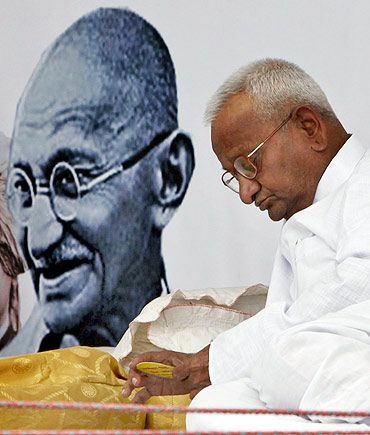 The Congress leader disapproved of Hazare's threat to go on protest if Parliament does not pass the Lokpal Bill by August 15 and his praise for Gujarat Chief Minister Narendra Modi saying that the veteran Gandhian should be careful of what he was speaking. Describing Hazare as a "simple, naive, simple-minded villager" who is being "exploited by smart people from town area", Singh said, "I can't call him to be supporting RSS or BJP cause. But he should be careful with some associates he chose. "The banner which was used as the backdrop (at the protest site) Bharatmata resembled that of RSS. One should be careful. People who are close to the Gandhian were somehow close to BJP also," Singh told Karan Thapar on CNN-IBN programme Devil's Advocate. He said the Gandhian was "unwittlingly" sending wrong signals and has become a front for some people. On the presence of father-son duo Shanti Bhushan and Prashant Bhushan in the drafting panel, Singh said Hazare should have been careful in choosing the right people as only the other day the court had issued notices against the lawyers for alleged undervaluing of their property and evasion of stamp duty. "He has been surrounded by a section of people who are trying to push their own cause. Why he has not taken Harsh Mander or Aruna Roy (in the joint committee)? They are also competent, honest and as dedicated as others. Even more, I would say. "Arvind Kejriwal is a chela (follower) of Roy. If Roy has been taken, it would have been better," Singh told Thapar. 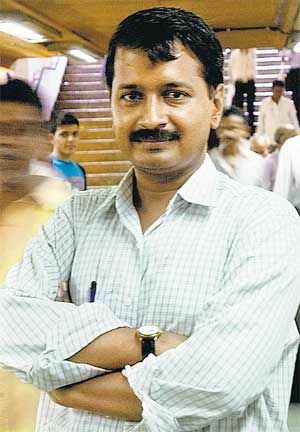 Kejriwal is one of the five civil-society members in the ten-member panel. Singh also rubbished Hazare's allegations that a section of people was trying to create discord in the movement and said such things were bound to happen as it had got hyped by media. On Narendra Modi, the Congress leader wondered how he could praise the BJP leader as a "great Chief Minister" whe he has not appointed a Lokayukta for the past eight years. 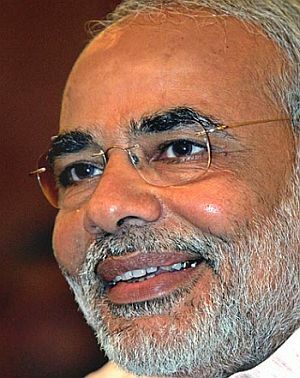 "There is no forum in Gujarat to complain about corruption," he said. "The Home Minister (Amit Shah) is charged in a false encounter case and he is known to be an extortionist...There are many more allegations against Modi. How can one term Modi as an honest man," Singh said, adding, the 73-year-old anti- corruption crusader did not know whom he was praising. Asked about Justice Sawant Commission of Inquiry Report, which found Hazare guilty of corruption, he said the news came as a "rude shock" to him and this was going to create problem for the social activist as it will erode his credibility. Terming Hazare's comments on Indian voters as "uncharitable and very very deregatory", the Congress leader said in the last 60 years, people all over the world have acknowledged the strength of India's democracy. On Hazare's remarks that he will lose deposit if he stands for elections, Singh said the Gandhian "underestimates" the Indian voter and if he contests from the area where he had worked, he would "win hands down". 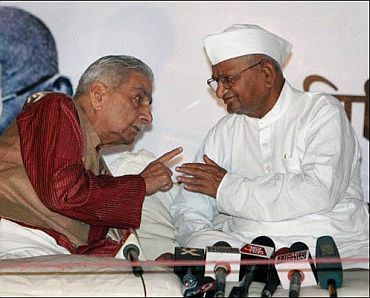 Reacting to the deadline set by Hazare for the passage of Lokpal Bill, Singh said the protestors were "overdoing it". "Undervaluing the authority of democratic values and traditions and Constitution is not justified. It is not good for country or democracy," he said adding if the MPs need more time they should be given time in framing the legislation. "I am not asking to ignore or take notice (of the deadline. All parties have to get together and bring about a consensus...These things are done at the threat of a barrel of a gun. Consensus have to be evolved. All political ideologies have to get together to have a comprehensive Lokpal Bill, which can take on corruption," he said. Singh also did not find anything wrong in bringing bureaucrats or judges under the ambit of Lokpal. He also said there was nothing wrong in videographing the joint committee meeting.